Reverso La cresta de Fiji seguida por el peso, el año de emisión, la pureza y el contenido de la moneda. La cresta de Fiji seguida por el peso, el año de emisión, la pureza y el contenido de la moneda. Moneda de plata Envejecida Armada Terracota 2018 de 5 oz de la Casa de la Moneda Scottsdale Enjoy the internet’s lowest price, when you order your 5 oz 2018 Scottsdale Mint Terracotta Army antiqued silver coin from our online store today. This 4.5 mm, ruptured edged coin is the first in a series from the renowned Scottsdale Mint, featuring the famous ‘terracotta army,’ discovered in the tomb of Qin She Huang, the founder of the Qin Dynasty. 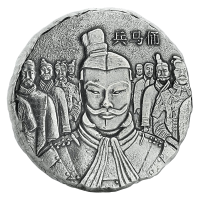 The coin’s obverse features a meticulously detailed artist’s rendering of Qin She Huang, with his terracotta army in the field, all expertly antique polished and minted with rough texturing. No other markings distract from this magnificent obverse feature, save the coin title in Mandarin characters, visible in the upper right quadrant. The coin’s reverse features the Fijian national crest, displayed in high detail against a rough textured field. Also on the reverse, the name, Fiji, the year of issue, the coin’s unique denominational value, as well as its metal weight, purity and content. Discovered in 1974, Qin She Huang’s terracotta army was intended to guard his spirit through its journey to the afterlife. Catch the first edition of what promises to be another wildly popular series from Scottsdale; diversify your holdings with a 5 oz 2018 Scottsdale Mint Terracotta Army antiqued silver coin today.